Mouse anti Dog CD11c antibody, clone CA11.6A1 recognises the canine CD11c cell surface antigen, a member of the alpha integrin family. Canine CD11c is expressed by monocytes, granulocytes and by dendritic cells. Danilenko, D.M. et al. (1992) Canine leukocyte cell adhesion molecules (LeuCAMS): characterization of the CD11/CD18 family. Affolter, V.K. and Moore, P.F. (2002) Localized and disseminated histiocytic sarcoma of dendritic cell origin in dogs. Bird, R.C. et al. (2008) An allogeneic hybrid-cell fusion vaccine against canine mammary cancer. Vet Immunol Immunopathol. 123: 289-304. Catchpole, B. et al. (2002) Generation of blood-derived dendritic cells in dogs with oral malignant melanoma. J Comp Pathol. 126: 238-41. Isotani, M. et al. (2006) Efficient generation of canine bone marrow-derived dendritic cells. J Vet Med Sci. 68: 809-14. Liu, C.C. et al. (2008) Transient downregulation of monocyte-derived dendritic-cell differentiation, function, and survival during tumoral progression and regression in an in vivo canine model of transmissible venereal tumor. Cancer Immunol Immunother. 57: 479-91. McDonough, S.P. and Moore, P.F. (2000) Clinical, hematologic, and immunophenotypic characterization of canine large granular lymphocytosis. Mathes, M. et al. (2006) Evaluation of liposomal clodronate in experimental spontaneous autoimmune hemolytic anemia in dogs. Ricklin Gutzwiller, M.E. et al. (2010) Comparative analysis of canine monocyte- and bone-marrow-derived dendritic cells. Ibisch, C. et al. (2005) Functional canine dendritic cells can be generated in vitro from peripheral blood mononuclear cells and contain a cytoplasmic ultrastructural marker. J Immunol Methods. 298: 175-82. Wang, Y.S. et al. 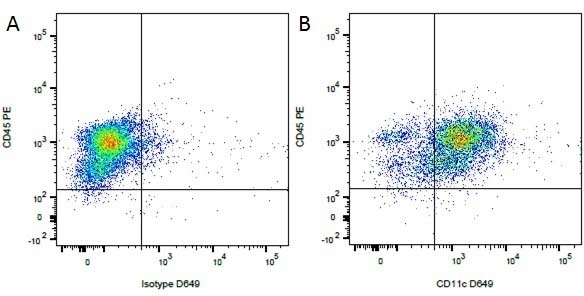 (2008) Cytokine profiles of canine monocyte-derived dendritic cells as a function of lipopolysaccharide- or tumor necrosis factor-alpha-induced maturation. Vet Immunol Immunopathol. 118: 186-98. Schwartz, M. et al. (2008) Selective CD11a upregulation on neutrophils in the acute phase of steroid-responsive meningitis-arteritis in dogs. Vet Immunol Immunopathol. 126: 248-55. Pai, C.C. et al. (2011) Immunopathogenic behaviors of canine transmissible venereal tumor in dogs following an immunotherapy using dendritic/tumor cell hybrid. Vet Immunol Immunopathol. 139 (2-4): 187-99. Figueiredo, M.M. et al. (2013) Expression of Toll-like Receptors 2 and 9 in cells of dog jejunum and colon naturally infected with Leishmania infantum. Larsen, A.K. et al. (2013) Entry and elimination of marine mammal Brucella spp. by hooded seal (Cystophora cristata) alveolar macrophages in vitro. Michael, H.T. et al. (2013) Isolation and characterization of canine natural killer cells. Vet Immunol Immunopathol. 155 (3): 211-7. Constantinoiu, C.C. et al. (2015) Mucosal tolerance of the hookworm Ancylostoma caninum in the gut of naturally infected wild dogs. Parasite Immunol. Jul 27 [Epub ahead of print]. Stokol, T. et al. (2015) Alkaline phosphatase is a useful cytochemical marker for the diagnosis of acute myelomonocytic and monocytic leukemia in the dog. Vet Clin Pathol. 44 (1): 79-93. Heinrich, F. et al. (2015) Passage-dependent morphological and phenotypical changes of a canine histiocytic sarcoma cell line (DH82 cells). Vet Immunol Immunopathol. 163 (1-2): 86-92. Qeska, V. et al. (2014) Canine distemper virus infection leads to an inhibitory phenotype of monocyte-derived dendritic cells in vitro with reduced expression of co-stimulatory molecules and increased interleukin-10 transcription. PLoS One. 9 (4): e96121. Paoloni, M. et al. (2015) Defining the Pharmacodynamic Profile and Therapeutic Index of NHS-IL12 Immunocytokine in Dogs with Malignant Melanoma. PLoS One. 10 (6): e0129954.